People offer countless excuses for failing to maintain HVAC plant – ‘It’s too expensive… too disruptive… too timeconsuming… too difficult… too much effort’, the justifications go on. The arguments in favour of maintenance are, however, powerful and the cost is absurdly low when compared with the cost of dealing with a catastrophic equipment failure. 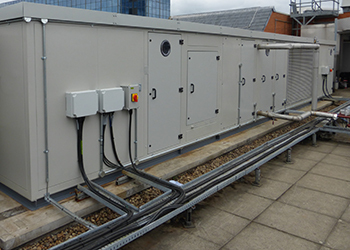 Air conditioning components consume enormous quantities of energy – chillers, for example, are responsible for using more than half the energy used on some buildings – so keeping them working at optimum efficiency will effectively contribute to a company’s bottom line. It also saves energy and therefore operating costs, retains the assets’ value, enhances the business’s reputation, leads to better working relationships and reduces disruption to the business. Increasing energy costs are another good reason to employ an effective maintenance strategy. Best practice maintenance can deliver cost savings of 10% to 40% compared with poor maintenance. And implementing a maintenance plan will ensure a longer a life for the AC system, reducing total cost of ownership. But all this begs an important question: how do you go about formulating a plan? Broadly, maintenance improvement is in five steps – determine where you are now (with an audit); decide where you want to get to (what are your critical success factors? ); plan how to get there; implement the plan, and return to step one (to complete the continuous improvement cycle). Here are some tips I’ve developed from my experience over the years with HVAC maintenance. We have also produced a free guide to HVAC system maintenance that includes more details. • Start with a diagnostic (basically an audit of current maintenance activities) followed by a broad brush initial assessment to identify areas for improvement, then a detailed justification of individual projects selecting specific methods to achieve overall business objectives. • Good HVAC maintenance begins with a commitment from the top of the organisation to develop a corporate policy on maintenance, repair and overhaul that is unified and clearly communicated. From here, an effective maintenance strategy can be developed with the policies (aims) and strategies (the means for achieving the aims) sometimes combined into a single document. • Corrective maintenance involves restoring defective equipment to a working condition as quickly as possible. 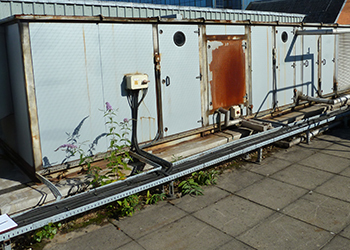 It is reactive and unplanned because remedial work is carried out as and when equipment fails in operation. • Planned preventive maintenance (PPM) is designed to ensure the best possible operation of equipment and avoid expensive unforeseen equipment failure or shutdowns. PPM includes tests, measurements, adjustments, parts replacement and cleaning performed specifically to preclude faults – is a two-part procedure. • Predictive maintenance means examining the ‘vital signs’ of the HVAC system through testing, inspection and monitoring. This condition-based maintenance approach employs tools such as vibration analysis, infrared thermography, ultrasonic testing and motor current analysis to monitor systems and diagnose problems in advance. • Reliability-centred maintenance is used to determine what must be done to ensure that a HVAC system continues to do what its user wants it to do. It can be used to gather data from the results achieved and feed this back to improve future maintenance. It focuses on the function rather than the equipment – in other words, what the system does rather than what it is. In many cases, there are compelling reasons to choose refurbishment and repair – supplemented by effective maintenance – over replacement of air conditioning systems. For example, it can extend the lifespan of existing systems, increase their operating efficiency, save energy, boost performance, and reduce running costs. It is less expensive than swapping plant and offers the opportunity to upgrade the existing specification by taking advantage of the latest energy efficient EC plug fans and components. environmentally friendly because it re-uses existing equipment rather than introducing new plant and its embodied carbon. • A maintenance policy is a written statement that defines the standards to which a building and its services will be maintained. The policy will typically contain a list of the maintenance goals; an outline of the maintenance strategy, and key performance indicators to measure progress in the maintenance programme. • The maintenance strategy can contain one or a mix of types of maintenance including corrective, preventative, predictive and reliability-centred (see the box). • Dirty equipment is disproportionately responsible for HVAC equipment failures. A simple cleaning regime will allow fan motors to run more efficiently, coils to remain unsoiled for longer and less frequent changes required for internal filters. • Good housekeeping practice is part of good maintenance. So, set timers so that there is no cooling when the building is unoccupied. Avoid out-of-hours operation. Check temperature settings. Clean ductwork, fans and grilles regularly. • Finally, protecting physical assets such as the HVAC system is all very well, but your most important asset is people. Protecting them is paramount so ensure that they can gain safe access to equipment that is to be maintained.